Do all ferments contain alcohol? Is it possible to ferment without any alcohol produced? It's a question I get a lot (!!!) and I'm happy to answer it today for #AskWardee. The Question: Do Lacto-Ferments Contain Alcohol? But How Much Alcohol Is In Ferments? Hi! I'm interested in starting to use ferments in our home and am doing some research on lactic acid fermentation and wondered if you could help me. I have been looking at your website and from what I understand lactic acid fermentation does not produce alcohol, is this correct? Or does it produce a small amount of alcohol? If it does produce alcohol, is there any type of fermentation that eliminates the production of alcohol completely? Thank you for your help! Elizabeth, thank you for your question! Lacto-fermentation involves the work of lactic acid bacteria consuming the sugars and starches in foods and through that process, creating a fermented food such as sauerkraut. During the fermentation of that food (in this case, cabbage), these beneficial bacteria produce lactic acid, ethanol (a form of alcohol), and carbon dioxide. And often our ferments have some yeast activity going on, too. Yeast fermentation produces alcohol (which converts to vinegar with time). Although I could be wrong about this, I reason that most ferments we do in our homes involve diverse combinations of lactic acid bacteria and yeasts, meaning we are nearly always going to produce some alcohol, often without even trying. So if you're still wondering… does yogurt contain alcohol? Even though certain bacteria used to culture yogurt don't produce alcohol, we're not normally making yogurt in a closed environment, so there will be other bacteria and yeast present producing alcohol. It's just the way it is. To avoid alcohol, one should avoid fermented foods. In other words, fermented means alcoholic. Ok, so alcohol in ferments is hard to avoid. But how much is there? You might want to know this to decide whether or not it's an amount you are willing to tolerate. Even though I can't give you specific amounts (there are so many variables), there are some guidelines that will help you determine which ferments are likely to have more alcohol than others. First, fermented fruits and other high sugar/starch fermented foods and beverages are likely to contain more alcohol, from .5% to 2% and possibly even higher, while low sugar/starch ferments such as sauerkraut probably do not have nearly as much. If any ferment is fizzy, it could have a higher concentration of alcohol (such as a fizzy kefir or ginger beer or Kombucha). If you've been wondering if all fermented drinks contain alcohol, then the answer is yes, at least some. Naturally fermented sodas tend to be fizzy, and made with fruit — both of which encourage alcohol production. If a ferment is done in an air-tight container, any alcohol produced is trapped inside and not allowed to disperse or convert to vinegar. On the other hand, an open-air ferment may create alcohol initially, too, but the ferment being open allows that alcohol to disperse and convert to vinegar. So you see there are a lot of variables! In cast you're interested, my friend Patty wrote an article, Fermenting In Pickl-It Jars, where she talked about using this closed air fermentation system to reduce alcohol content as well as other things (such as histamines). Check out my Lacto-Fermentation 101 Free Video Series RIGHT HERE. And if you haven't already, CLICK HERE to download our FREE “Fermenting Formulas” Cheat Sheet, where I share formulas so you can create your own safe ferments using the product you have on hand — salsas, relishes, krauts, beverages, and more! We also have extensive archives of ferment recipes here! Are you concerned about alcohol in ferments? Have you wondered before if all fermented drinks contain alcohol? What have you done about it? I really enjoy sauerkraut, but can’t eat it. Every time I do I can’t stop coughing and wheezing. I have trouble breathing. I can eat canned sauerkraut, but read that that isn’t the real thing. I’m hesitant to try any fermented products. I was going to start fermenting at home. Guess I’ll have to skip it. It sounds like you might be reacting to histamines that are present in some fermented foods. 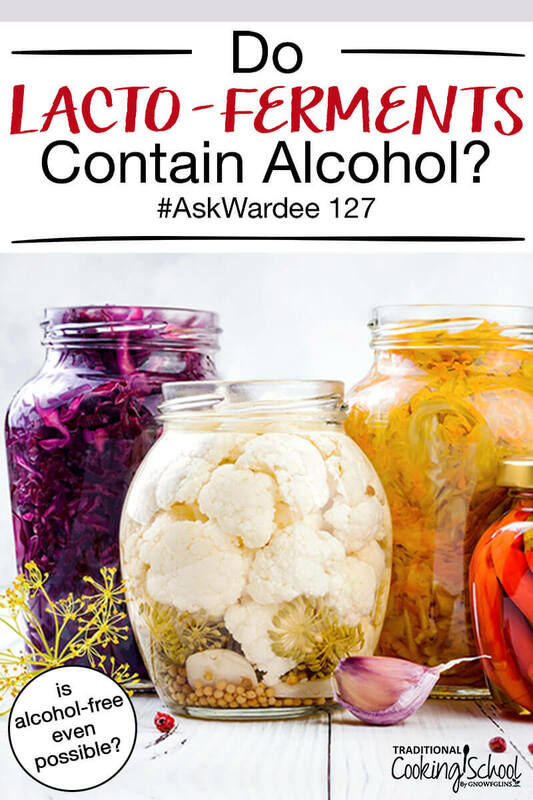 Wardee mentions in this post that there are ways to reduce histamines in the foods you ferment at home. Also, a gut-healing diet like GAPS might help you eventually be able to tolerate ferments better.